I have been using my NAS named JBPersonalCloud for a while, and I always used Wi-Fi to connect to my home network. A few days ago, I connected my Mac to my home network via both Wi-Fi and Ethernet for a couple of minutes to test the Ethernet speed. But then I dropped the wire and remained Wi-Fi only. However, since then, Finder has started to show my NAS as JBPersonalCloud-2. But there is no second JBPersonalCloud, and I am using the original connection interface (Wi-Fi). I have tried to reboot the NAS, the router, and my Mac.But the -2 suffix still is there. Is there a way that I can change it back? Thanks! Sorry, it looks like I made an assumption there. The name you see in the Sidebar is the name of the device as it is advertised on the network. When you had the device connected to both wired and wireless networks, it probably saw itself on the network and automatically changed the name to avoid a duplicate. To fix it, you will need to go into the administration panel of the NAS and change the name back to JBPersonalCloud. If it appears correct in the admin panel, then change the name to something completely different, and then change it back. There is probably a “JBPersonalCloud” remnant in /Volumes directory. 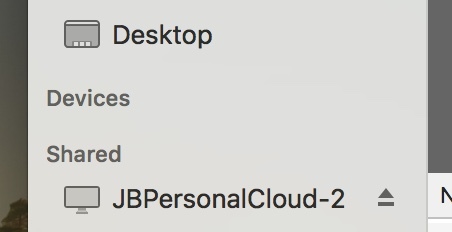 When you connect the NAS, the system sees that there is already a “JBPersonalCloud” and appends the “-2” for the newly connected NAS. Disconnect the NAS and delete the remnant with the Finder or Terminal then reconnect the NAS. Finder: Select “Go to folder...”, enter /Volumes and tap “Go”. This will open the Volumes folder in a window where you can delete the remnant. Simply drag it to the trash (you may need to authenticate). It will ask for an administrator password. Not the answer you're looking for? Browse other questions tagged network finder nas rename remote-disc . Possible Methods to Restore Speed of File Sharing (AFP) in OS X 10.10? Use Automator for saving file on NAS, what happen if NAS is not accessible?